Today started out looking pretty low key. We intended just to hang out at the campsite and relax in the rain. I thought we would have nothing to write about. Boy did that ever change. Take a step back in time with me, two years ago we set out on our own Great Alaskan Adventure. We thought that we were so great, living on the edge, setting up our little tent trailer wherever we wanted. Not very many people go on adventures like this!!!? We are going on the craziest adventure I’d ever heard of! As we traveled through Tok, AK we stopped and talked to a father and son riding there bicycles from Whitter, AK all the way home to Calgary, AB!! This was now the craziest thing I’d ever heard of. Then in Denali National Park we met Jim and Ramona, a retired couple who just drove up in their camper from California for the summer. The year before they toured all of South America, just driving their camper around for 5 months. Just hearing the stories of what they saw and the challenges they went through blew me away. This was now the craziest thing I’d ever heard of. Then this spring Greg tells me of Andrew Skurka who planned to walk 7500km around the perimeter of Alaska (approximately, see his site for map). We spent the summer months checking in on his Twitter page and seeing the challenges he faced. This was now the craziest thing I’d ever heard of. Fast forward to now, we are sitting under our awning after building a decent fire in the rain. Then from our left I get complemented on our good fire by a fellow with a German accent. We learn that his name is Peter and that him and his wife Judy are here from Germany. No surprise there, we see hundreds of rental units a day and a good percentage have a mini german flag in the window or hanging out of a rear compartment door. And I have talked with several of these German folks in rental RV’s and they are mostly doing 7-10 day trips. But here is where it gets interesting, Peter built his own 4×4 VW conversion van and shipped it to Halifax. There they met a couple from Switzerland who had also shipped over a classic VW van to do some touring. 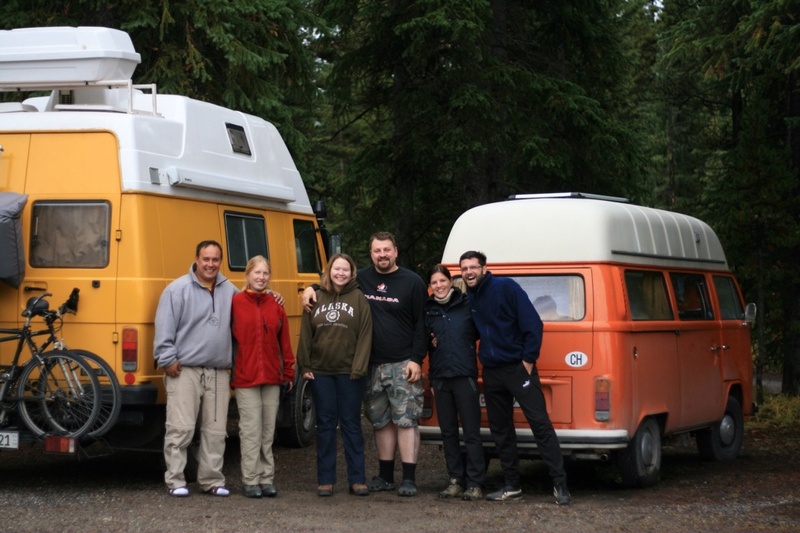 They parted ways in Halifax and by chance they found each other in Mosquito Creek Campground. So anyway, Peter had just complemented me on the fire and we got to talking, and then the Swiss couple, Frank and Isabelle wondered over and joined in and lastly Judy crams in under our awning. We all sat at the table and talked and talked. Once nightfall came and it got cold, we moved to the kitchen shelter and talked some more. We talked until one of us checked the time and it was almost 1am. I found it so interesting how Frank and Isa see the rockies so differently from the Swiss Alps and why they liked Saskatchewan so much. Anyway, I’m trying to wrap this up. So here is the punchline – these two couples are both doing roughly the same trip but completely separate. They are taking 13 months, camping all the way from Halifax to Vancouver, down the west cost to California, down through Mexico, into South America and ending at the most southern tip where they will ship their Vans back home. This is the Craziest adventure I have ever heard of. It’s great, my hats go off to these people for undertaking such an adventure. It was only a couple of years ago that I thought adventure had died at the hands of the internet and HD televisions. It is so great to see the spirit of adventure still alive, meeting others who still love a little grit in their adventures. But the most important thing is doing it with someone you love, building a strong relationship, overcoming silly obstacles and challenges together. Thank you Peter, Judy, Frank and Isabelle – we had the most wonderful time visiting with such fascinating people.